Last weekend, when it was 68 degrees and still August, I needed some comfort food. So I drug out my dutch oven and made something hearty. I know people who reject recipes with more than 5 ingredients. This one has 17. Four of them are meats, totaling just under four lbs. The first time I made it, I used all the meat it called for, which was insane. The final product was meatastic and made vegetarians cry for a 20 mile radius. I don’t make it that way anymore. 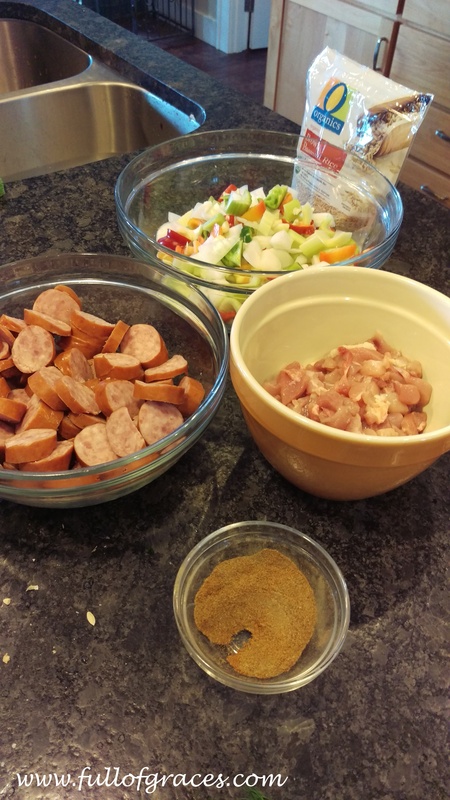 Instead, I stick to the bacon, chicken cutlets or thighs, one smoked or andouille sausage and shrimp. No meat or tofu would be good too. 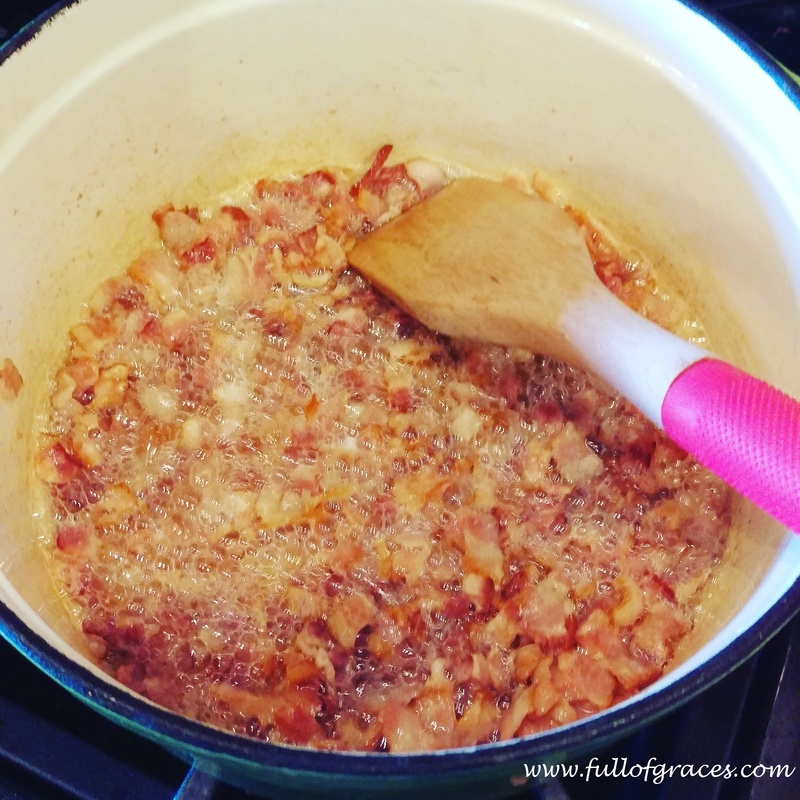 You have to love a recipe that starts with bacon as the base. There’s a lot of chopping to do with this recipe, so I employ my resident sous chef to help me out. I go large with the veggies, more than the recipe calls for: onions, celery, bell peppers, red, yellow, orange peppers, carrots, garlic. Here are the ingredients chopped up and ready to add. I would like to point out that when the recipe calls for 3 10 oz cans of tomatoes and chiles, it means the cans where the tomatoes and chiles are combined. NOT three 10 oz cans of tomatoes AND 3 10 oz cans of green chiles. Let me just say that would be a lot of chiles, if you happened to do it that way. I also do not add the chili pepper or the cayenne because the girls and I like our taste buds to function. For those whose taste buds have been burned away from years of hot wings, I serve sriracha on the side. Lastly, since we don’t eat white rice, I had to learn to simmer the pot for twenty minutes after adding the brown rice and before throwing it in the oven or the rice will be al dente. Or hard. Depends on your perspective, whether you’re the person who just spent three hours cooking it or the knows-too-much-for-his-own-good 9 year old sous chef in the house. The recipe says 10 servings but it is way more than that for us. Everyone usually has seconds and then we eat it for lunch the next day too. It holds well in the pot, if you wanted to leave it there with a stack of bowls and some crusty bread, and let everyone help themselves. Perfect for lazy football Sundays. All of this to say: Jambalaya—it’s not just for restaurants anymore.